When it comes to tequila, I prefer to use a nice blanco, but any type will do. Please don’t use the cheap stuff. You’ll ruin good tomato juice. Tequila has a very distinct flavor. The low quality distillations can easily overpower the flavor. Pour enough tequila to fill the glass to about the one third of the way full. Top it off with good tomato juice and sprinkle a little celery salt on top. 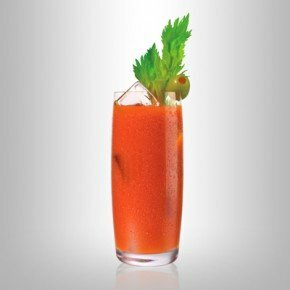 Clamato juice also works pretty well for those who prefer a thinner consistency. Time to garnish. I’ve used everything from chorizo-stuffed chili peppers to pickled jalapeno peppers. !Que comida mas rica! The Bloody Maria recipe is a great festive alternative to the standard bloody Mary recipe. Serve it at your next Cinco de Mayo cocktail party, Dia De Los Muertes, or any occasion. It’s not just a bloody Mary, it’s a bloody Maria! For any even bolder, more spicy bloody Maria recipe, try infusing your tequila with jalapeno pepper for a week or two. Simply drop two to three peppers into the tequila a week before serving. The spice your bloody Maria dons will be fresh and delicious! CARAMBA! Often, people who don’t normally drink bloody Mary’s find this drink a refreshing alternative. Try out the bloody Maria recipe with the next person who tells you they don’t like bloody Mary’s!